Week 1 – It is ON!! If you have not already done so, make sure you have read and understood the post titled “Read This Before Starting The 6 Week Kettlebell Program“. All the pertinent instructions are there and will make it easier for you to understand the sequence. Move fast but avoid rushing. Moving fast does not mean rushing! 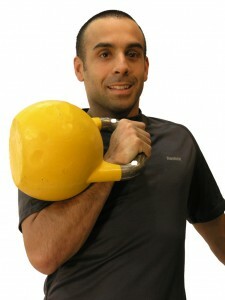 Make sure you are comfortable with both the the Kettlebell Rack and the Kettlebell Athletic Position . Here is your workout. Make sure you have rested at least a full day to recover from day 1. You may need more time if you are too sore. Remember, the exercise or combinations conclude once you reach the recommended number of sets (including rest time) OR you reach the alloted time, whichever comes first. Refer to the video below for a demonstration of the exercises. This is the conclusion of week 1. If you are just getting started with an exercise program, this should be enough work for the week. If you are adding this program to your current exercise routine, the overall volume is low and should not affect your recovery. And just like that Week 1 is over. Get a much deserved break and get ready for Week 2!